―Nagano is known for its beautiful nature, and also for agricultural products such as apples and lettuce. Nagano prefecture’s agriculture is closely related to the longevity of its residents. The prefecture is number one in Japan for the average life expectancy of both men and women. Considering Japan is the country with the highest life expectancy in the world, Nagano is the longest-lived region in the world. There are many factors for this, but one is diet. Most people probably think of the prefecture as one of the largest fruits and vegetables producers and in fact residents of Nagano prefecture are number one in Japan when it comes to the amount of vegetables consumed. Agriculture is a part of the healthy lifestyles people live. From the perspective of disseminating information overseas, we have been moving forward with an overseas strategy for agricultural products. 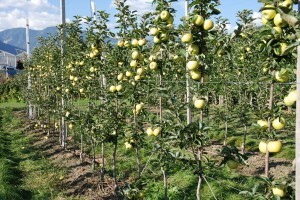 Shinano Gold, a type of yellow apple developed in Nagano's Fruit Tree Experiment Station, is being cultivated in a test run for commercial cultivation in Italy’s South Tyrol, the largest apple producing region in Europe. This is part of an agricultural strategy using intellectual property rights, and the prefecture receives some income for each seedling. As Shinano Gold apples become more popular, they will help promote Nagano fruit as being of high quality. A lot of grapes are also grown in Nagano. It is not widely known, but Nagano prefecture is the number one producer of wine grapes in Japan. 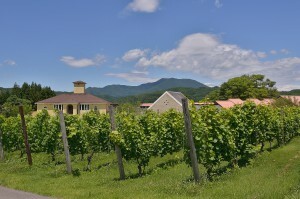 Yamanashi prefecture is more frequently thought of in connection with wine, but sometimes it is Nagano grapes being used to make that Yamanashi wine. A “Shinshu Wine Valley Plan” is being carried out, with more and more people who want to run wineries coming to Nagano, with the total now up to 32 wineries. One strong point of Nagano wine is that it is made using traditional grape varieties like merlot and chardonnay, making it simple to sell overseas. You might think that tourists from overseas are more interested in drinking sake than they are in drinking wine. Nagano is second only to Niigata when it comes to number of sake breweries, with 82 in the prefecture. So we have both delicious wine and a variety of sake. We would like for visitors to experience longevity through diet, with not only these liquors but also Nagano-grown vegetables, such as lettuce and celery, and mushrooms such as eryngii and enoki. ―It is clear that there is a strong connection between agriculture and a healthy lifestyle. Since 2013, Nagano Prefecture has been working on building its brand under the slogan “Shiawase Shinshu” [NAGANO, Land of Happiness]. That is quite a catchy slogan. It was decided on with the hope of making everyone in the prefecture happy. Things like road maintenance are obviously an important responsibility of the government, but I would like to increase the level of happiness that residents feel in their daily lives. This is difficult to quantify, but according to Japan Research Institute studies of happiness levels by prefecture, Nagano prefecture is consistently ranked highly, and in 2013 was No. 1. Our brand strategy is for development that still places importance on local strengths including longevity, good health, hard-working residents passionate about education, and abundant natural resources. ―It is important not just to be long-lived, but to live a healthy, long life. 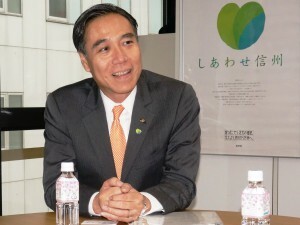 Part of the prefecture’s five year plan (NAGANO, Land of Happiness Creation Plan) is the Health and Healthcare Promotion Project, both of which are vital to healthy long lives. Can you tell us some details about this project? Saku, Nagano is home to the Pinkoro Jizo, which is said to provide blessings for living out your natural lifespan in good health. I myself have gone there and prayed for the blessing. There are many factors for living a healthy long life, but it is important to understand that Nagano prefecture did not become the longest-lived prefecture without any effort. The healthcare in the prefecture’s agricultural villages was not always good. With the dietary culture of eating pickles, many people would eat too much salt and pass away from cerebral hemorrhages. In response, after the war doctors and nurses from Saku General Hospital, Suwa Central Hospital, and other hospitals would visit different areas to hold plays and study sessions in order to promote healthy lifestyle and eating habits. These activities formed the foundation for local health volunteers that promote healthier diets or provide health advice, helping protect the health of communities and contribute to healthier living. With Nagano’s average life expectancy now the highest in Japan for both men and women, other local governments are trying to catch up. In order to stay in the lead, the Shinshu ACE Project was started in 2014 to improve the health of Nagano residents. The project encourages three ways to prevent lifestyle diseases: Action (exercise), Check (health check-ups), and Eat (healthy diet). What is unique about this project is that it is not just local communities participating, they are cooperating with businesses. For example, working with health insurance societies to encourage people to get check-ups, or encouraging restaurants, cafeterias and convenience stores to provide healthier choices. 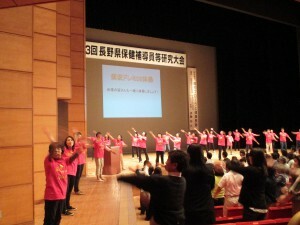 The prefectural office also has the entire staff, including me, do aerobics during working hours. I have also made a personal goal of limiting my salt intake. 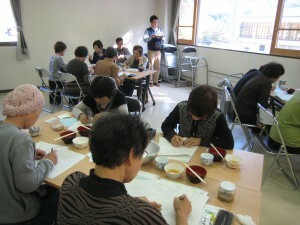 I also believe the diligence of Nagano residents helps contribute to living healthy, long lives. Being an agricultural prefecture is also a factor, but Nagano has the highest rate of employed seniors in Japan, with many people wanting to work as long as they are able to. ―That is wonderful. I understand that in addition to this health and medical project, you are focusing on education. What initiatives is the prefecture involved in? As part of our relationship with other countries, we are working on promoting higher education. A prefectural university with a four-year program is planned to open in 2018. Some people question the necessity, considering the aging population and declining birth rate, but universities are a center for knowledge, which can be a major factor in regional development. Looking at innovative regions in other countries, there are many cases where they are developing along with universities. There are two unique characteristics of this new prefectural university’s educational goals for its graduates. The first goal is that they have a global perspective, and the second is for them to be able to innovate locally. To meet these goals, it is a requirement that all students study abroad. Also, all first-year students are required to live in dormitories, with life in the dormitories also considered a place of learning. By cooperating with universities in other countries, we would also like to increase the number of opportunities for exchange programs. With the goal of ensuring there is ample opportunity for both practical and academic studies, the planned chairman for the university is former Sony president Mr. Kunitake Ando, and the planned president is Keio University honorary professor Dr. Masumi Kindaichi. Other universities in the prefecture include Shinshu University, which is a national university, and private universities Nagano University and Matsumoto University, all of which are said to contribute significantly to the region. With the establishment of a Higher Education Support Center, the prefectural government will support reforms of universities within the prefecture and act as an intermediary for contact with universities from outside the prefecture, in order to help connect universities with the region. ―Next I would like to ask about Mountain Day. With this new national holiday first being celebrated on August 11 this year, and Nagano prefecture being known for its magnificent mountains, how will you be promoting Nagano inside Japan and overseas? Nagano prefecture’s mountains are a treasure of not only Nagano, but of Japan and of the whole world, and I feel we are just their caretakers. In order to protect them, the support of many people is necessary. The other day, we entered into an agreement to protect the biodiversity of Nagano prefecture with Mitsubishi UFJ Research and Consulting and Teikyo University of Science (located in Tokyo). There is also a Forest Foster Parent system in place where organizations and businesses from outside the prefecture provide not only financial support, but also provide direct support, such as by having their staff help with thinning. It is necessary not only to protect the mountains, but to use them as well. Since so many people lost their lives in the 2014 eruption of Mt. Ontake, new mountain climbing safety regulations have been established. In addition to precautions for volcanoes, there are new rules for people who go onto the mountains, and regulations for the maintenance of climbing paths that were until now maintained by the effort of related people. The prefectural government is supporting efforts to determine for each mountain area what should be left as it is naturally, and what should be modified if necessary. 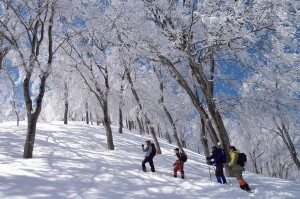 Preparations are underway so that many people can visit Nagano’s mountains. 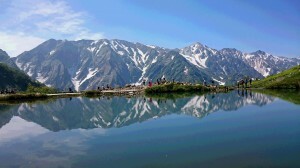 The inaugural National Ceremony for Mountain Day will take place at Kamikochi in Matsumoto, Nagano on August 11. I would like to take this opportunity to let people around the world know about the beauty, bounty, and magnificence of Nagano’s mountains. ―Inbound tourism is an exciting topic for all of Japan. What features of Nagano prefecture would you like to promote to foreign tourists? The feature that draws the most overseas tourists is the snow monkeys of Jigokudani Monkey Park. It is amazing how popular they are. Ninja are also popular with foreigners, and Nagano is home to Togakure-ryu ninjutsu. A “samurai route” going to various areas with connections to ninja and samurai has become popular with foreign tourists recently, and we are cooperating on promotion with the other local governments involved. Each season is also noticeably different in Nagano, so there are different ways to enjoy it depending on the season. 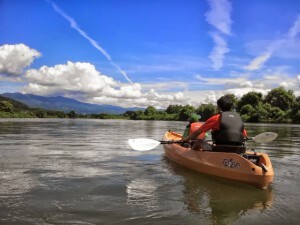 Many outdoor activities are available, including winter sports like skiing and snowboarding in the winter, or cycling, canoeing, and kayaking in the other seasons. Other countries have the infrastructure in place for people to enjoy outdoor activities, but in Japan they still seem to be the domain of a limited number of people. I would like to see outdoor activities become more popular. As a first step, an activity center has been opened at Iiyama Station, one of the stops on the Hokuriku Shinkansen line that started operation in 2015. It rents out bicycles and trekking equipment. The goal is for people to be able to enjoy themselves without having to bring anything with them on the train from Tokyo. Since the 1998 Winter Olympics and Paralympics were held in Nagano, we are confident in the quality of snow available to visitors for winter sports. While the 2020 Summer Olympics and Paralympics will be held in Tokyo, the 2018 Winter Olympics and Paralympics will be held in PyeongChang, South Korea, and the 2022 Winter Olympics and Paralympics will be held in Beijing and Hebei, China. Nagano and Hebei have a friendship cities agreement, and officials from Hebei have already come to research preparations for the Olympics. By sharing information through this kind of exchange, I hope to help develop an atmosphere conductive to winter sports in East Asia. ―In addition to efforts to attract tourists, I understand you also have initiatives underway to attract businesses. Nagano prefecture has always had a relatively large manufacturing industry, and over the years it has progressed from silk production to manufacturing precision and electronic equipment. One world-famous Nagano company is Seiko Epson, a precision equipment manufacturer with its head office in Suwa. One new development is that the area around Iida has been designated as part of the Special Zone to Create Asia's No.1 Aerospace Industrial Cluster. There is a business there that makes parts for the Mitsubishi Regional Jet (MRJ) and another that deals directly with the Boeing Company. Since there are many companies in Nagano that already possess advanced technical capabilities, I believe that with initiatives such as businesses forming consortiums together they will be able to achieve the full benefit of being located in Nagano. Aside from developments in the aerospace industry, there is also the Aqua Innovation Project that was jointly proposed by Shinshu University, Hitachi, Toray, and Nagano Prefecture. The concept of this project is to solve the world’s water issues by using nanocarbon technology. These are just a couple of examples of how I would like to use local strengths to attract businesses in industries such as aerospace, environmental technology, and healthcare. ―We will do our best to help tell the world about the diverse attractions of Nagano prefecture. Thank you for speaking with us today.